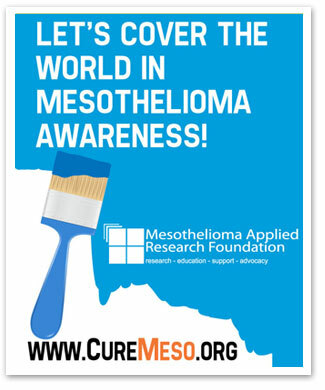 On Sept. 26, Mesothelioma Awareness Day, the Insulators Union wants to paint the world blue! This cancer has greatly affected the members of our Union. To raise as much awareness as possible, we ask that mesothelioma patients, their families, those who have lost loved ones to mesothelioma, friends, neighbors, and acquaintances to WEAR BLUE. The key is to keep blue as the central color of our organization to raise awareness in person and online. The idea is to portray visually with the color blue the concept of mesothelioma awareness as it widens its reach. Visit the Meso Foundation Store if you would like to purchase blue items for Meso Awareness Day. Mesothelioma Awareness Day, established by Meso Foundation volunteers in 2004, has been the driving force behind the movement to bring more attention to this cancer and funding research for a cure. We ask that you and your union Brothers and Sisters participate by wearing blue on Sept. 26. Please send photos showing your support to kwagner@insulators.org.